After legendary singer Luther Vandross sang "This man is the Doctor" on one of his biggest hits, Grammy Nominated Guitarist DOC POWELL signature sound took off and is now sealed in music history on over 200 songs by some of the biggest artists in every genre of music. He has recorded 12 critically acclaimed solo projects featuring many stellar jazz artists. His latest project; This Is Soul, had critics proclaiming this to be his best solo project to date. "Stepping Out" is his brand new single, featuring keyboardist Shaun Martin (from Grammy Award Group Snarky Puppy), hot new flutist Althea Rene and R&B singer/songwriter Gary Taylor. 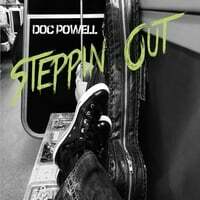 "Stepping Out" moves Powell into a new zone, creating a song that's high tech, while integrating sounds from dance, pop, funk, hip hop & jazz- elevating his sound to the next level.